Under the new collective agreement, the General Mills members will see improvements to vacation language and job postings and will also receive one hundred percent coverage from an expanded list of approved safety footwear. In addition, members will see their wages rise by $1.70 per hour over the next four years. Wage increases are retroactive to November 1, 2018. General Mills Canada is a production facility that makes Pizza Pops. UFCW 832 represents roughly 90 members at the Winnipeg plant working in production, shipping, and other departments. 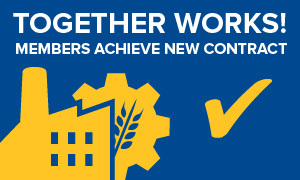 To read more about the new union contract at General Mills, click here. UFCW Local 832 is Manitoba’s largest private sector union, representing over 18,000 members in a wide variety of industries, including the retail food, health care, food processing, security, industrial, textile, and transportations sectors. To learn more about UFCW 832 and its outstanding work, visit www.ufcw.832. How can I enjoy the benefits of a UFCW contract?